Sunny was named for his friendly and cheerful personality. This little male cat wandered in my yard about two months ago (roughly) – very thin and very timid (thinking he was feral). Did the usual – trapped, kept in recuperation, released in yard, and he’s been staying and getting more and more friendly as days passed. Wants to be petted and rubbed all the time! Purrs every time I pet him now! I can hold him in my lap now. What a sweetie. A little rough with playing with my other outside cats, but getting better and better all the time. Sunny, a sweet affectionate beautiful cat (about a year old) wants an indoor home that comes with a warm lap! He just wants to be loved (and to play)! Neutered, rabies vaccinated (I plan to take to vet for rest of vaccines). If you can provide the indoor home, the warm lap, and lots of love, please call 412.650.6546. (evenings and weekends), 412.469.6294 (day), or email: scaldrone@ccac.edu or salvatrese@gmail.com. Help a friendly kitty end his wanderings to find a happy home, and help his rescuer after she’s done so much for him and so many others. 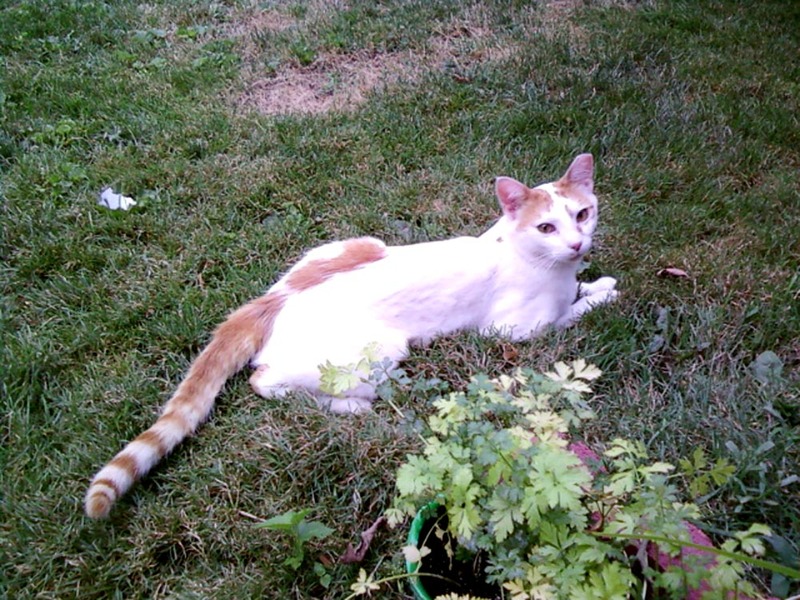 Sunny is located near Pittsburgh, PA.
← Cats in the Library, But What Kind of a Cat is That?